World-renowned German Ska-musician with eight letters - clearly, there is only one possible answer: his name is RING DING - Dr. Ring Ding! 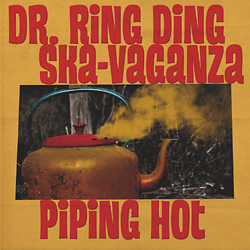 Since the beginning of his career in 1987 where he joined the cult Ska band El Bosso & die Ping Pongs of his hometown as second front man and trombonist, Dr. Ring Ding has propelled Ska in Germany like no other. In 1992, he formed Dr. Ring Ding & the Senior Allstars and helped traditional Jamaican Ska gain country-wide attention for the first time. The debut album "Dandimite!" did not only become a milestone in Germany but gained the doctor highest acclaim worldwide. style: The Skatalites, Lee Perry, Derrick Morgan, Judge Dread, Laurel Aitken, The Pioneers, Rico or Dennis Alcapone - to name but a small selection. out of Catalonia, the Freedom Street Band (Barcelona), from Germany Mathias Demmer of The Busters and Markus Dassmann of The Senior Allstars, Genís Bou (Gramophone Allstars, Girona), on top of that Jazz-experts like the American singer Stephanie K., the young trumpeter Bruno Calvo from Càdiz and vibraphonist Altfrid M. Sicking as well as percussionist Markus Passlick. A notable sensation is the guest appearance of Doreen Shaffer (The Skatalites) for a duet of the special kind. indeed: outstanding vocal and instrumental tunes, penned by the chef himself, in addition to that adaptations of a Catalan ("El Cant Dels Ocells") and a German folk song ("Freedom Of Thought" is an Afro-Caribbean Ska-version of "Die Gedanken sind frei"), and a Rock Steady-version of Peter Gabriel's "Don't Give Up". All affectionately arranged and produced, played by outstanding musicians who share the passion for the old school beats with the band leader. Trad-Ska at its best! With this new album, Dr. Ring Ding succeeds to live up to his first album "Dandimite!". Like that milestone, "Piping Hot" is also released on Pork Pie, this time in cooperation with the Catalan label BuenRitmo in CD and LP formats.